According to the U.S. EPA, a whopping 85% of all discarded textiles – 11 million tons – are sent to U.S. landfills every year. 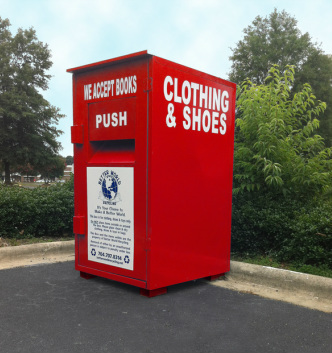 Better World Recycling, a green organization, works to reduce this textile waste by providing convenient locations where you can drop off your unwanted clothes, shoes, toys and books any time of the day, any day of the year. By putting them back in the use cycle we conserve precious natural resources, prevent greenhouse gas emissions and save landfill space. What's more, these unwanted items are put towards social good once they are redistributed to those who are less fortunate. Our programs provide a growing number of green jobs in our local community and support a vast array of local small businesses, as well as other organizations that are having a positive impact on people and the planet. As a new initiative we are excited to announce that we are now accepting books of all kinds. If your organization is in need of books or has unwanted books please let us know. For your convenience we are now offering a free service to pick up your unwanted clothing, shoes, toys, and books at your home or business. Contact us to make arrangements that fit your schedule today. Check out these twelve easy steps to reduce your carbon footprint.